EuroConference Center hosts a complex of conference rooms with a total area of 240 m2 located on the first floor of the Eurocentrum Office Complex. We offer high finishing standard, modern technical facilities and professional staff. 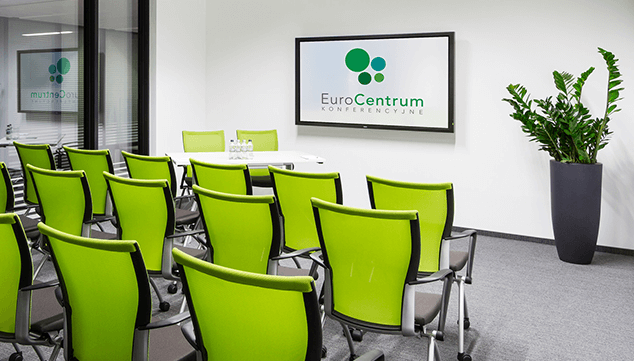 The EuroConference Centre consists of four training and conference rooms. We will open the fifth room - Niebo (The Sky) - in the first quarter of 2019. This is a large 97 m² sunny and extremely comfortable room, which has two screens and two full HD overhead projectors. The large area lets you have any arrangement desired - let us know and we will prepare it to fit your needs. The hall has a built-in sound system. The windows to the room can also be entirely shaded. The “sticking” wall fosters unrestricted creativity, which can be a perfect complement to training or workshops. Air-conditioned, spacious and offering flexible adjustments. Tables fitted with electrical sockets for connecting computers. The Earth Room is a bright, air-conditioned, comfortable room with a screen, a full HD overhead projector, built-in sound system and floorboxes in the floor. Depending on your needs, the room can be 100% shaded. The “sticking” wall is an interesting way of arranging space and helps fostering creativity during presentations or trainings. The large area of the room makes it flexible to arrange it to your needs. The room has an area of 30 m². Perfect for smaller meetings. An intimate, quiet room will ensure peace and focus during the meeting. Plasma screen with HDMI/VGA inputs. The room is fitted with floorboxes making it easy for your guests to work on their own computers. Bright, air-conditioned, thirty sq. meters room with a view of Jerozolimskie Avenue and the Eurocentrum Walkway. The room is equipped with a plasma TV with HDMI/VGA inputs. The room can be shaded for more optimal conditions to focus on the presentation. Electrical sockets are fitted into tables.